First and foremost, the Multi-Tab stays exactly where it has been installed. The liner never opens prematurely when the cap is opened. This is important to consumers as a visual security cue. If the liner comes off when the cap is unscrewed, the consumer simply can't tell if it arrived in his/her home intact or whether it has been tampered with or previously opened. By ensuring the liner remains on the container throughout the process of opening, Kornelis provides companies with a simple way to guarantee consumers enjoy a positive and secure usage experience. The induction liner, made of foil, can be affixed to several materials, including PET and glass. It does not have a cardboard base, which makes it ideal for a number of products where space is at a premium. 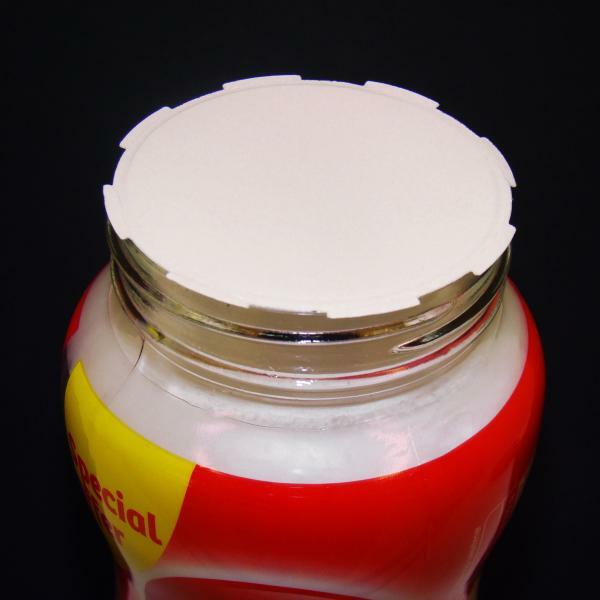 It also offers a number of tabs around its edge to provide a simple way to peel it off the top of the container. This makes where the liner should be gripped patently clear and facilitates removal no matter in what orientation the container is. Barrier properties are also enhanced with the liners, meaning the contents of the container the liners top are kept dry and fresh throughout their shelf life. The liners are perfect for a number of products requiring appropriate storage, like baking sprinkles, spices, powedered products, and others!